Your old friends . . . where are they now? Sandy was a member all through her high-school years. She grew up near the Rideau Canal and remembers how wonderful it was when its banks were much wilder and full of birds than they are now. The Macoun Club took her out on field hikes she doesn’t think she would ever have been able to do on her own. The key thing for young people, she says, is to be out there. 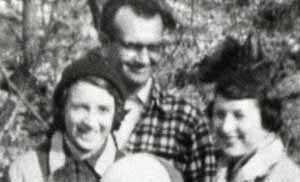 She is shown here (far left) on a 1956 field trip to Gatineau Park with bryologist Howard Crum and leader Vi Humphries. At university, she was the only person whose ambition was to own a swamp — a dream that came true many years later when she became the owner of some significant wetlands on 50 acres of Frontenac Shield forest near Westport. Sandy went on to do all kinds of things that required the abilities she had developed during her Macoun Club years. She is a researcher who has surveyed birds for both the 1981-85 and 2001-2005 Breeding Bird Atlases of Ontario, has a Breeding Bird Survey route, and has taken part in Forest-Bird Monitoring. Her interest in flora led her to become President of the Ottawa Horticultural Society, and a board member of the Canadian Heritage (Rose) Garden established at Rideau Hall in 2000. Teaching outdoor and nature skills to youth has given her great pleasure — with Guides, Tuulik Wilderness Adventures Co., and with her own two children. Stephen Darbyshire was a Macoun Club member in the 1960s, up until 1971. He was well known for his expertise with snakes and other such creatures. He also developed an interest in botany. You can find fern specimens that he collected 30 years ago in the Club herbarium. At the beginning of the 1980s, Stephen came back to Macoun Club as a leader; he also helped out again in a big way in the early 1990s. For many years he worked for Agriculture and Agrifoods Canada, in Ottawa, studying grasses. His fieldwork has taken him into northern Quebec and to Mexico. He retired in 2018. Grant was one of the Macoun Club’s birdwatchers, and he took up botany for a time, too. He still lives in Ottawa and carries his camera to both the Study Area and Mary Stuart’s Pakenham property. Many of the wildlife photographs appearing on Macoun Club webpages are his. In 2006 published a book of short poems (haiku and senryu), Their White With Them>, which reveals his continuing close personal connection to the natural world. The Macoun Club wouldn’t have the wonderful Study Area it does today, if it weren’t for Loney and his fellow Macouners. In 1969 they were outraged to discover our first Greenbelt study area being indiscriminately logged under the pretext of salvaging elm trees, then dying in great numbers from Dutch Elm Disease. Loney knew his trees and was able to show that other species were being passed off as elms. The authorities conceded the point, and offered us the use of another, as yet unsalvaged section of Stony Swamp. He himself led the way by producing our first bird list, followed by trees, and then lichens. 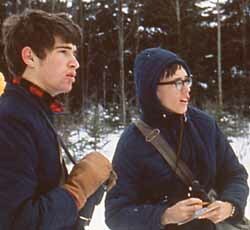 Shown here in 1971 (on the left), he became the Club’s official Field-Trip Coordinator, and got members out there every weekend, including Rob Lee (right). Loney studied at Lakehead University, and then conducted biological inventories around Georgian Bay and Algonquin Park, which led to the designation of important natural areas. He also coauthored the book Rare plants of the Yukon. In 1981 he joined the Canadian Wildlife Service and worked on shorebirds in the Mackenzie River Delta, later identifying important shorebird staging areas across the prairies. In the late 1990s, he spent five years helping develop Canada’s Endangered Species Act, and then became Chief of the North American Bird Conservation Initiative. Now, he and his wife (also a biologist) live near Edmonton, and own a bush property that is not unlike the Macoun Study Area, with lots of beaverponds. “Imagine us,” he suggests, “listening to the elk bugling in the fall, and watching the family of Trumpeter Swams that raised four cygnets this year.” In 2018, he revisited what he remembers as Mary Stuart’s Pakenham lands. Rob was a member of the Macoun Club from 1965 to 1974. He was much involved in mapping the ‘New’ Study Area at Bell’s Corners. The photo above shows him there with Loney Dickson (left) in 1971 (though it was a winter day, Rob had pencil and notebook in hand). After Macoun Club, Rob went away to the University of Guelph to study wildlife biology, and afterward went on a series of independent journeys in the Arctic, living alone in a small tent for months at a time. In 1985, Rob came back to Macoun Club as one of the leaders . . . and in 2019 he’s still there! He launched new programs of investigation at the Study Area.. Although Macouners see him mostly on field trips, he does in fact chair the OFNC’s behind-the-scenes Macoun Club Committee. Rob lives surrounded by forest an hour’s drive west of Ottawa. His continuing interests have run to geoarchaeology, Leopard Frogs, Leatherwood Treehoppers, and lichens. He is behind a drive to identify all the lichens in the Study Area — a project begun by fellow member Loney Dickson in 1972. His efforts in Lanark County have yielded dozens of species new to the Ottawa valley, and led to the recognition of certain obscure cedar swamps in Lanark County as not just old-growth, but “ancient” forests. Bob was a member of the Macoun Club during his high-school years, from 1975 to 1979. He became deeply involved in Study Area projects and played a prominent part in the Club’s wider ranging expeditions, from camping at Mary Stuart’s Pakenham property to canoe trips in Algonquin Park. Birds seem to have been his first great interest, but he soon got into plants in a serious way, and eventually a wide range of natural history subjects, including butterflies and dragonflies. 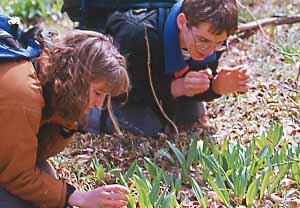 Fifteen years after graduating from the Macon Club, the Ottawa Field-Naturalists’ Club recognized his ever-growing expertise and the enthusiasm for sharing it with the 1995 Member of the Year Award, in 1995. Bob’s long-time partner Christina Lewis has said that Bob remained an active birder and naturalist until the day he passed away, in the summer of 2013. A short tribute was published in Trail & Landscape in the first issue of 2014. 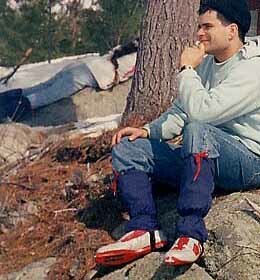 Lorin was a very active member all through the 1980s. 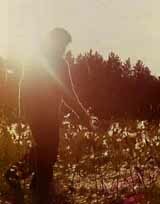 He seemed to be at every meeting and field trip; as he got older, he organized many a camping trip. 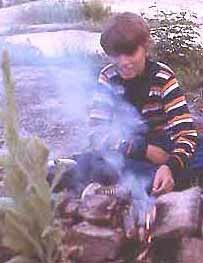 Here he is as an Intermediate, tending a campfire out on the point on the upper pond at Pakenham in 1988. By the time he was in Seniors, Lorin was looking around in the Study Area for independent study projects for school biology classes. First he surveyed the woodlands for patches of Ground Cedar, and in a later year, Porcupines. Both studies were written up for the Little Bear, with useful maps and observations. He also became Editor of the Little Bear. Lorin went to the University of Guelph. Summers he worked as a naturalist in Ontario’s provincial parks. Then studied molecular transport across membranes in graduate school, and later worked in a major medical research laboratory in the States. Now he lives in Vancouver, B.C. Dave Manga joined the Club in Grade 4, and was another tremendously active member during the 1980s. He always came out on field trips and, while Lorin Gaertner was studying Ground Cedar in the Study Area, David studied another common clubmoss, Ground Pine. He also began work on the Nannyberry shrub, and picked up where others had left off on wildflowers. Dave was much involved in the workings of the Club, being President at various times from his Junior days on up. He edited the newsletter, and eventually the Little Bear. He won our Baldwin Scholarship in 1988, and a Special Award in his last year, 1991. Only a year after leaving the Club as a member, Dave returned as one of its youngest ever leaders. He even served as Chair of the OFNC’s Macoun Club Committee. Finally, his university studies became too serious to ignore, and he had to move on. Dave moved to British Columbia, where he continued his exploration of the outdoors in some really wild places. He started his own business, designing and producing board games such as Conjecture and The Great Canadian Bird Watching Trivia Game. Sometimes, people find out about Macoun Club only at the last minute, during their last year of high school. Jen Line made up for it by staying involved for years afterward, whenever she was in Ottawa. She joined us at the Study Area (with William Godsoe, left), and took part in camping trips in every season of the year. She even made innovative presentations at our indoor meetings. With quite a background at birds, it made sense for her to volunteer at the Long Point Bird Observatory. 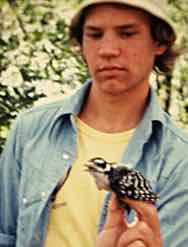 That led to summer work banding birds in the boreal forest. The way we heard it, she’d have to rise in the dark in order to be in position before the birds got up. Five hours later, trudging back to the field station in mid-morning, she’d meet the botanists just heading out for their day. It was enough to make anyone think. The next thing we knew, Jen was splashing around northern wetlands to collect aquatic plants, doing comprehensive ecosite surveys, and assessing old-growth forests. Jen graduated from the University of Guelph, and in a moment of inspiration chose for her Masters’ research an obscure little plant with a disjunct distribution that would take her from the wild northern shore of Lake Superior to the farthest tip of the Yukon in one jump. 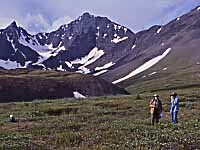 She found her tiny False Asphodel in many fabulous settings, including Kluane National Park (with Arnold Gaertner, at right). At the beginning of 2019, she returned to Ottawa and has become a Macoun Club leader. Shelby Banner Temple joined the Macoun Club halfway through his high school years, and quickly involved himself in our field studies. He identified and wrote about the small fish of the Study Area beaver ponds, and illustrated his article with beautiful line drawings. Through his writing in The Little Bear, he also brought to our attention a new invasive plant there that was not yet even in the wildflower guides: European Frogbit. He is shown here holding up a delicate sheet of absolutely clear spring ice at Pakenham. “I took several years getting my degree at the University of Victoria because I did the Co-op program, which gave me many great work experiences,” including the job in Fiji. Shelby subsequently completed a Masters degree on the behaviour of larval fishes on the east coasts of Canada and Brazil, through studies at universities in both countries. He has now returned to Victoria, B.C., and is investigating vision in salmon for a Ph.D.
Not surprisingly, for a former Macoun Club member, Shelby now volunteers at a local public school, introducing young children to the excitement of the natural world through the Let’s Talk Science Program. All photos donated or provided by members and leaders, past and present. Updated in part January 3, 2019. Coding revised in August 2013 and May 2016. Additions made March 22, 2016.